If it's a smart, well designed and built to last Gillette Mach3 compatible razor you're looking for this is the one for you. The handle is made from a metal alloy with a shiny black aluminium sleeve. This is not a cheap, throwaway plastic disposable like the ones found in supermarkets. It uses Mach3 blades which are readily available worldwide. Mach3 blades give close and comfortable shaves when sharp. Keep the blade sharp and get up to 150 shaves from one blade with the quick and easy to use RazorPit blade sharpener and save a fortune on replacement blades! Finished in traditional jet black the razor comes with a plastic box - so handy for travel. We worked hard to get the weight and balance of this razor just right, we know you will like it. 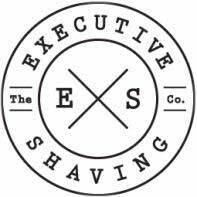 The Executive Shaving logo on the handle is your guarantee of quality. The sleek aluminium handle provides perfect grip and balance. The Gillette triple blade technology has three blades specially positioned to extend gradually closer to your beard, to give you a close shave in one single stroke. The razor is branded with the Executive Shaving Company logo. Ensure you are using a clean and sharp Gillette Mach3 cartridge blade. After applying a pre-shave treatment and your shaving soap, cream or gel to your face, dip the razor into warm water and begin to shave. We recommend that you shave twice with the grain and once against the grain for a close shave. This is an exceptional razor in both looks and performance and will give you a close shave time after time. Do you want to save some money and prolong the life of your Mach3 blades? Click here to find out more about the RazorPit Razor Blade Sharpener - guaranteed to prolong the life of your blades to up to 150 shaves. Metal alloy with a sleek, shiny aluminium sleeve.